JUST FINISHED THIS FOR A CUSTOMER. IT MEASURED 64" X 48" TALL. THE OPENING WAS 36" X 28" TALL BUT WE CAN DO ANY SIZE. FROM EUROPE TO YOU, INC WILL NOT ASSUME RESPONSIBILITY FOR ANY MERCHANDISE DAMAGES OCCURRING DURING TRANSIT BY ANY SHIPPER. OUR MAIN NY SHOWROOM IS LOCATED AT 2910 ROUTE 9W, SAUGERTIES, NY 12477. Get images that make Supersized seem small. Tailor your auctions with Auctiva's. 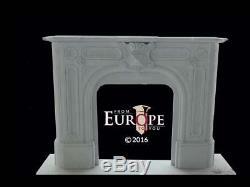 The item "HAND CARVED MARBLE VICTORIAN STYLE ESTATE FIREPLACE MANTEL RA158" is in sale since Thursday, August 2, 2018. This item is in the category "Antiques\Architectural & Garden\Fireplaces, Mantels & Fireplace Accessories". The seller is "fromeuropetoyou" and is located in Saugerties, New York. This item can't be shipped, the buyer must pick up the item.